Please refer to our stock # 2043 when inquiring. 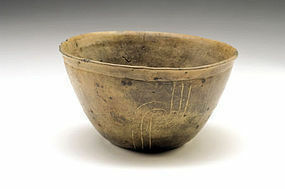 Mississippian Pottery Bowl, Southeast USA, circa 1200 - 1500 CE. Brown flared bowl with incised swirl patterns around body beneath grooved rim. Small chips on rim and light deposits, but in excellent condition. 6 3/4" D, 3 5/8" high. Ex: Heritage Auction Gallery. Mississippian culture, the last major prehistoric cultural development in North America, lasting from about ad 700 to the time of the arrival of the first European explorers. It spread over a great area of the Southeast and the mid-continent, in the river valleys of what are now the states of Mississippi, Alabama, Georgia, Arkansas, Missouri, Kentucky, Illinois, Indiana, and Ohio, with scattered extensions northward into Wisconsin and Minnesota and westward into the Great Plains. The culture was based on intensive cultivation of corn (maize), beans, squash, and other crops, which resulted in large concentrations of population in towns along riverine bottomlands.